Recuerdo del dr. Manjon, una estampa religiosa editada en 1934. ALPHA EEG (1) :BLOCKADE NONEXISTENT, RESULTING IN SPECIFIC FACTORS OF REACTIVE RESPONSES, ABSTRACTION OR NOT PATHOLOGICAL FANTASIES IN CHILDREN, YOUTH AND OLD AGE POPULATIONS. AN ACCOMMODATION OPINION INTEGRATIVE LEARNING EXPERIENCES OR CONSTRUCTS AND COMPLEX K.
ALPHA EEG (2) : Annexed: The relevance blockade of the alpha rhythm in the waking state. Observation of alpha blockade significantly interacting with the apprehension of factors higher mental functions. MEDITATION (1) : Research with electroencephalographic instrumental representation of virtual models on meditation and consequences in the ranges: physiological, psychological and behavioral. MEDITATION (2) : Annexed, Graphic full visual EEG experimentation process. Attached : Deep meditation, study of the conscious level in relation to the states of oneiroid and delirious confusion. Herbert Phillipson Object Relations Test (ORT).The ORT is based on the Object Relations Theory of Melanie Klein and Fairbairn. It consists of thirteen plates, twelve of which represent different situations of object relations and a plate blank, which is presented at the end of the test administration. ATLAS OF ELECTROENCEPHALOGRAPHY, IT CONTAINS FOR THE FIRST TIME A STUDY OF THE INTERACTIONS OF EMOTION AND COGNITION IN A POPULATION OF CHILDREN AND ADOLESCENTS WITH LEARNING HANDICAPS. (The PDF file is updated and expanded content). Atlas of Electroencephalography, ( E.C.G. - emotions cognitions, graphics) , it contains for the first time a study of the interactions of emotion and cognition in a population of children and adolescents with learning handicaps. Summary maps E.E.G. research on the interaction of emotions with cognitions.EEG showed a collection obtained in our research department, is only a sample, we consider the possibility of editing in the future a complete atlas with all EEG and detailed explanations of each. It should be detailed, the maps produced from this small atlas, this corresponds to children and adolescents ages 10 years to 14 years. Children and adolescents with cognitive handicaps, still have not reached the proper maturity of his age. BIOELECTRICAL BRAIN MADURATION IN RELATION TO AGE.In the investigation of emotions and cognition, the ages of the subjects vary in different phylogenetic stages of development, we show schematically the bioelectrical brain maturation in relation to age.In the investigation of emotions and cognition, the ages of the subjects vary in different phylogenetic stages of development, we show schematically the bioelectrical brain maturation in relation to age. ELECTROGENESIS (bio-electrical fundamentals) - PHYSICAL CHEMISTRY OF BIO-ELECTRIC PHENOMENA. This is a very summarized report, intended for specialists and scholars from bio-electrical fundamentals. We show in a simple, basic concepts of electro-genesis and physical-chemical substrate.Electrogenesis (bio-electrical fundamentals) - Physical chemistry of bio-electric phenomena. GRAPHICS E.E.G. SAMPLE FIELD STUDY OF AGGRESSIVE EMOTIONS - EMOTIONS OF FRUSTATION. IMPORTANT FIELD RESEARCH STUDY ON THE EMOTIONS OF FRUSTATIONS AND EMOTIONS OF AGGRESSIVENESS. VALIDATED BY A STUDY IN THE LABORATORY EXPERIMENTATION ELECTROENCEPHALOGRAPHY.The research experience was conducted in a number of experiences with people aged from 9 years to 20 years. (190 persons studied people). Measuring the frustration of the average of the population studied. The experiences of frustration were made based on different situations, emotional, cognitive tasks, abstract tasks, performing manual tasks or psychomotor. The study we show, is an example, obviously is much more extensive study, we will try in a short future it edit the full study. PROJECT - I - : the fear emotions, cognitions education project emotionally controlled laboratory experimentation. For the first time show the Foundation's Dr. Jordi Mas i Manjon a report on the project educated emotions, this project lasting more than thirty years, it has been studied and experienced the possibilities of a rigorous education in a scientific way (demonstrable in the laboratory) the different emotions. This report is an example of rigorous research in the field of emotions and cognitions. It is possible to educate, help understand the emotions interacting with cognitions from a scientific view, we can replicate, repeat laboratory conditions, all of which radically changes what was until recently thought it was just philosophical, it is possible do it methodically and effectively useless without philosophy without beliefs. Progressively edit all other emotions investigated in rigorous study method. PROJECT - II - Conscious and unconscious.In this study we show that the conscious and unconscious, this is only one, transitioning the role of clarity. This shows us the way forward, to educate these rhythms in a scientific way (demonstrable in the laboratory) to apply the methodology multiple re-educator genesis of adverse mental processes. Annotation of relevance: In psychoanalytic theory, Dr. S. Freud showed a conscious and unconscious, as if it was two different elements. In this study we show that there is only a gradual aware that depending on the degree drift to less conscious. When it is less conscious, as shown in the study, there is a predominance of slow waves, however when there is a gradual increase of being conscious causes an increased beta and gamma brain rhythm. In short: There is only one conscious and this consciousness is gradual. 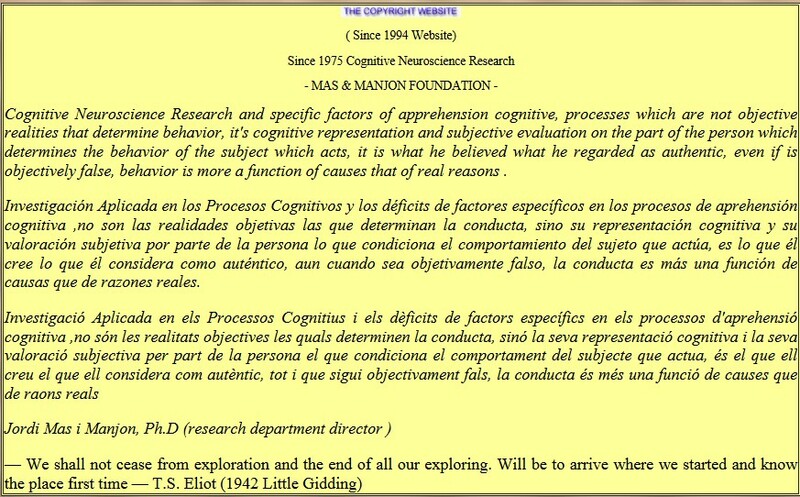 MAIL ONLINE, RESEARCH DEPARTMENT OF THE FOUNDATION, CONSULTATION ON REPORTS, GENERAL QUESTIONS OF THIS SITE, CLICK HERE & MAIL ONLINE, DEPARTAMENTO DE INVESTIGACIÓN DE LA FUNDACIÓN, CONSULTA DE INFORMES, PREGUNTAS DE INFORMACIÓN GENERAL DE ESTA WEB, PULSAR AQUÍ. 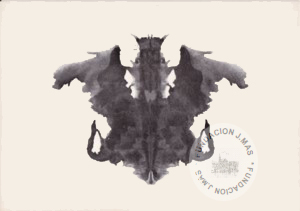 Psychoanalytic Laboratory - LABORATORIO DE PSICOANALITICA : MONOGRAFÍAS,MAPAS CONCEPTUALES de PSICOANALITICA REALIZADAS POR LA FUNDACION Dr.J.MAS: (RECOMENDAMOS DE MODO ENFATICO LA IMPORTANCIA DE LEER LA ANOTACION INICIAL QUE INDICA LA LINEA DE INVESTIGACIÓN APLICADA POR NUESTRA FUNDACION QUE ES DE CARÁCTER VANGUARDISTA CON RIGOR CIENTIFICO),RECOMENDADO POR EL ELEVADO INTERES CIENTIFICO. ACTUALIZACIONES EN PROGRESO. THE MORAL INTELLIGENCE COURSE © ID: 0911154885323 & "The ethical man he knows not to do evil. The moral man he does not do evil "
CURSOS INICIATORIOS, PREPARATORIOS PARA EL SIGLO XXI, UNA VISIÓN ESFERICA Y DIFERENCIADA DE LA REALIDAD CON LA VERDAD. Certificados de Publicaciónes : MEDITACION PARA LA GENTE CON PRISA ( Una presentación para personas no iniciadas en la meditación, diferenciando lo que es la meditación del estado meditativo , ).....& .Certificado de Publicación : CURSO DE INTELIGENCIA MORAL (desde una perspectiva no religiosa o filosófica sino pedagógica desde las ciencias cognoscitivas..... & Certificado de Publicación : MEDITACION CON EL SITAR (una presentación desde una poetica del lenguaje en busca de una consciencia subjetiva de la existencia y del mundo real diferenciando la verdad)... & Certificado de Publicación : MEDITACION: LA CIENCIA SUBJETIVA..(una presentación profunda de la ciencia subjetiva cognoscitiva)..
PERCEPCION MENTAL CONCEPTUAL ,MONOGRAFÍA Iª DE UNA SERIE,UN ESTUDIO RIGUROSO DEL PROCESO DE LA MENTE, QUE REGULARMENTE LA FUNDACION IRÁ EDITANDO. ESTE DOCUMENTALREALIZADO POR EL PROGRAMA DE TV-ENLACES, ES UN DOCUMENTO VISUAL, RIGUROSO, MOSTRANDO LA SERIA IMPORTANCIA DEL DESARROLLO AFECTIVO, LAS EMOCIONES, EXPONIENDO LA TEORIA DE LA REORGANIZACION SILENCIOSA DEL APRENDIZAJE ADQUIRIDO DEL DOCTO JORDI MAS i MANJON,UNA TEORIA PARA UNA COMPRENSIÓN MÁS AMPLIA DE LA INTERACCION DE LAS EMOCIONES CON LAS COGNICIONES EN LA APREHENSIÓN DE APRENDIZAJES. AQUEST ENLLAÇ ÉS AMB L'EDITORIAL DE L'AUTOR Dr.JORDI MAS i MANJON ,BUBOK PUBLISHING.S.L. - THIS LINK IS WITH THE AUTHOR'S EDITORIAL, BUBOK PUBLISHING S.L.,ENLACE CON LA EDITORIAL DEL AUTOR. A Sample of the BLACKY TEST. (1) THE BLACKY PICTURES Gerald BLUM 1950, a very useful test to explore the personality in a dynamic way, in the test the fellow should improvise an argument that explains the scene of the sheet, it is a test of projection of a great interest to apply in the childhood. PSYCHOLOGY INSTRUMENTS. A QUITE COMPLETE SAMPLE OF THE MATERIALS TEST , TEST BATTERIES THAT ARE APPLIED IN A HABITUAL WAY. MANUAL DE TECNICAS DE SUTURA QUIRURGICA, MANUAL DETALLADO. ESCRITS D'UN BARCELONÍ DE LA SEVA CIUTAT NATAL BARCELONA: Un intent afortunat d'un Barceloní per recuperar memòria de la Barcelona dels prodigis, lectura per a gourmets de la memòria de la nostra cultura. IMPACTO DE LAS LESIONES DEL HEMISFERIO DERECHO SOBRE LAS HABILIDADES LINGÜÍSTICAS ; PERSPECTIVAS TEORICA Y CLÍNICA. EFECTOS COGNITIVOS DE UN ENTRENAMIENTO COMBINADO DE MEMORIA Y PSICOMOTRICIDAD. 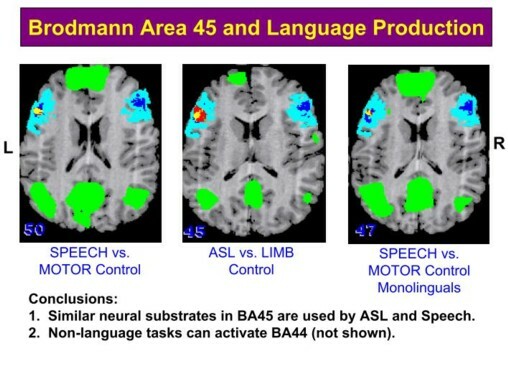 SIMULATED AND EXPERIMENTAL RESULTS ARE QUITE SIMILAR IN POSTERIOR BRAIN AREAS. THESE RESULTS PROVIDE VALIDATION FOR OUR LARGE-SCALE NEURONAL MODEL,ESPECIALLY ITS BEHAVIOR DURING SMALL TIME INTERVALS. Bifenilos Policlorados (PCB) Se expone un estudio investigación sobre las graves interacciones con la vida humana de los Bifenilos Policlorados (PCB), es de sumo interés, avalado el estudio por numerosos investigadores, la Fundación J.Mas, quiere resaltar de nuevo el hecho de actividades que son altamente perjudiciales para la vida en el presente y para el futuro, numerosos niños en todo el mundo, nacen con graves deficiencias neurológicas, muchas de estas deficiencias neurológicas suelen pasar desapercibidas, nosotros deseamos, que no se olvide nada de esto que es noticia preferente, para paliar y evitar posibles consecuencias futuras imprevisibles. 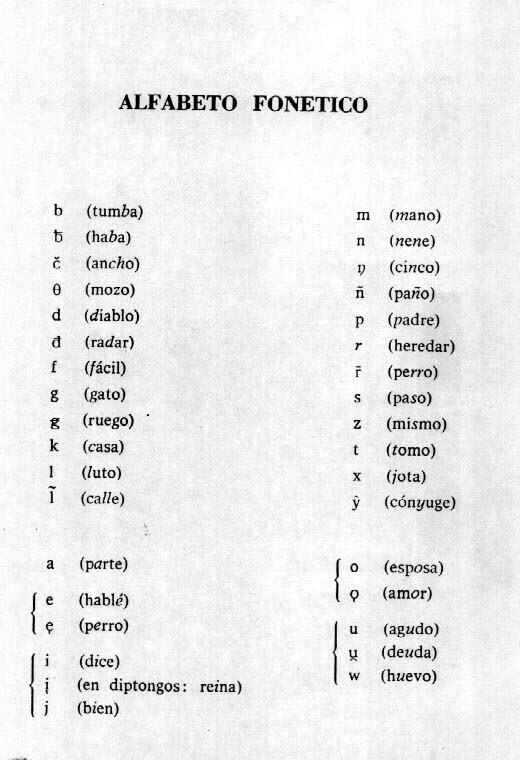 Recuerden los lectores de este estudio. Todos somos responsables de lo que sucede y sucederá. SINDROME DiGEORGE .Muestra del estudio del síndrome DiGeorge, con nuevas premisas terapéuticas desarrolladas por la FUNDACION J.MAS, TEMA DE ELEVADO INTERES. ENURESIS-ETIOLOGIA-MUESTRA DE UN ESTUDIO GENERAL ESPECÍFICO FUNDACION J.MAS, TEMA DE INTERES EN LA COMPRENSIÓN DE LA ENURESIS. 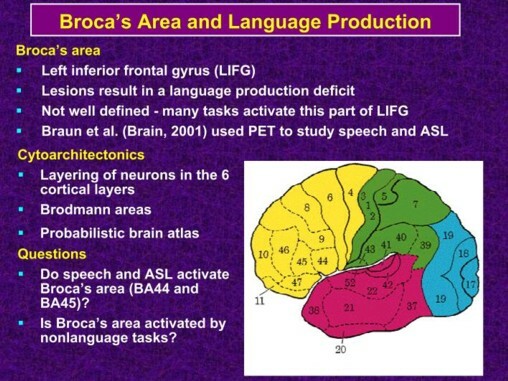 Simulation of Human Language Acquisition Process by Brain Like Memory System,A revised study and endorsed by the Foundation Dr.J.Mas, for the importance of the contribution of this report.